Teradata received the highest scores in three of four use cases in the Gartner report, “Critical Capabilities for Data Management Solutions for Analytics,” issued March 16, 2018 by analysts Rick Greenwald, Adam M. Ronthal and Roxane Edjlali. 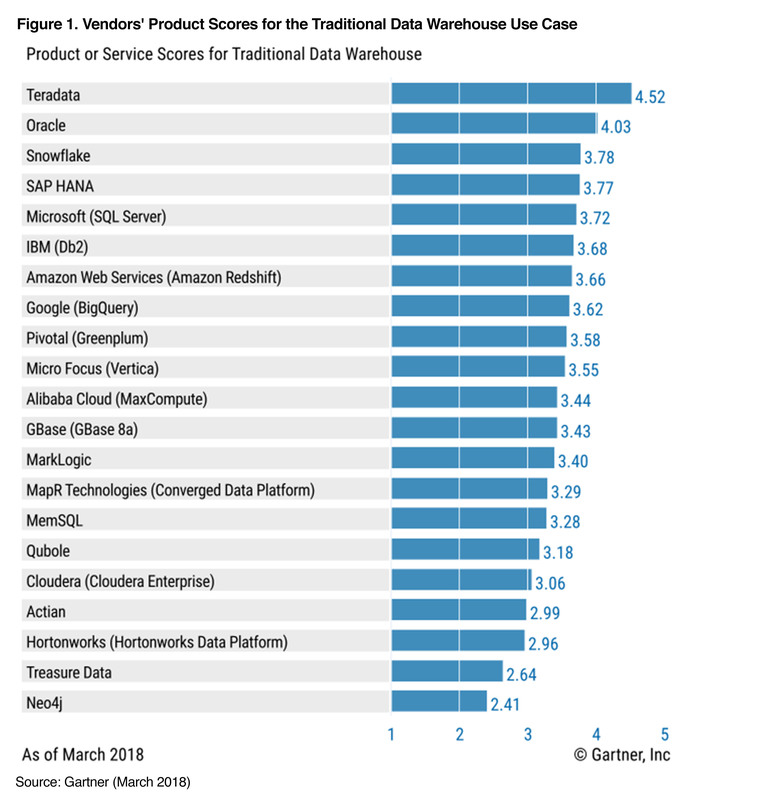 Teradata (NYSE: TDC), the leading cloud-based data and analytics company, is one of 21 vendors evaluated in the report, which is a companion note to the 2018 Magic Quadrant for Data Management Solutions for Analytics , issued Feb. 13, where Teradata was named as a Leader for the 16th consecutive time. The “Teradata Everywhere” strategy meets and exceeds market demands by delivering the full power of Teradata software across a mix of public cloud and on-premises environments, with unprecedented platform choice and flexibility. As a foundational component of Teradata Everywhere, the Teradata Analytics Platform takes this concept even further by delivering a unified platform with the best analytic functions, the leading analytic engines, the industry’s preferred commercial and open source analytic tools and languages, and support for a wealth of data types. This allows data scientists and business analysts to execute a wide variety of advanced analytics techniques, including artificial intelligence-based analytics. By doing this within a single workflow, the Teradata Analytics Platform allows for better, faster and more precise insights based on all data, rather than a subset. Underpinning these innovative solutions is IntelliCloud, Teradata’s platform as-a-service offering for analytics at scale. With Teradata managing the infrastructure and guaranteeing system availability, customers gain a high-performance, low cost per query analytic platform capability, and are free to focus on delivering valuable business insights. Teradata IntelliCloud is available now and the Teradata Analytics Platform will be available later this year. Gartner, “Critical Capabilities for Data Management Solutions for Analytics” Rick Greenwald, Adam M. Ronthal, Roxane Edjlali, 16 March 2018.